The Fed cut interest rates 50 bps yesterday but the big news was the downgrade of FGIC which lost its AAA rating. The equity market rallied on the Fed cut, but sold-off on the FGIC announcement. Bonds rallied strong on the FGIC announcement after selling off on the Fed cut. Of course, the Fed cut was to a large extent discounted in the market, so it was the surprise of FGIC that caught the attention of the market. The structural issues are also more important to the finance community than the cost of funds. The cost of funds has decreased from all of the Fed cuts, but in the short-run, the write-down of assets is more important to the capital bases of financial institution and investors. The credit crisis is not about rates but about the access to new capital and the valuing of existing loan portfolios. Cuts in the rating of bond insurer will have an immediate impact on the value of any bonds that have been protected. Of course, the market has already discounted most the AAA rating for this bonds, but now investors will have to truly realize the loses. There is no going back to AAA. MBIA posted its biggest quarterly loss and needs to raise capital. This is what will drive the market and not the lowering of funds by 50 bps. If MBIA loses its AAA rating, it will have an impact on over $650 billion in investments. If the government wants to help with this problem, it needs to think about the capital base of these insurers. Mervyn King was appointed to serve a second term as governor of the Bank England. He has been respected central banker over his tenure, but has been under criticism during the the current credit crisis for doing too little too late. There has been similar comments about Fed chairman Bernanke. The expectation is that the key central banker will provide special leadership during times of high uncertainty. For all of the talk about setting targets for monetary policy, it still seems like the man makes the central bank. While inflation targeting along with Taylor rules have taken hold with many of the central banks, it is still the cult of personality that have kept markets calm. Governor King has done a great job of maintaining inflation within the Bank's target while managing a long period of prosperity. Yet, the quality of his leadership will be tested in 2008. The credit crisis is not over, growth is slowing and the pound is overvalued. It is America-lite. We will have an interesting test comparison between Bernanke and King during similar economic environments. Money drives the stock market or at least that is the conventional wisdom of investors. Do not fight the Fed. The transmission from a monetary policy change to equity prices can come through three mechanisms. One, there is a change in dividend yield. Two, there is a change in the discount factor. Three, there is a change the level of risk with stocks, the equity risk premium. A lowering of interest rates reduces the discount factor for future earnings and makes bonds less attractive. A cut in the short rate improves the overall economy which effect top-line growth and should improve the dividend yield. Finally, a cut in rates will change the level of riskiness in equities through smoothing out consumption and wealth in the economy which would have a positive impact on stock prices as the equity risk premium declines. But should monetary policy be used to help the stock market during times of stress? At the extreme, in a liquidity crisis the answer is yes, but what about a situation like last week. Goldman Sachs points to a speech that Ben Bernanke made concerning the interaction between monetary policy and equity prices which we reviewed in detail. It is important reading on research conducted pre-2003. Bernanke focused in the impact on monetary policy and finds that unanticipated monetary policy changes do affect equity prices. There is no surprise here albeit there are other important influences on stocks, yet his research suggests that the impact is actually very modest. His research focused on the unanticipated impact of monetary policy. Specifically, he compared the Fed fund futures forecast versus the actual monetary policy action. This represents the surprise impact which should be the portion of monetary policy that affects equity prices. The Fed funds futures does a decent job of making a policy change prediction, so the actual impact on stock is less than the full change in policy. Bernanke’s research measures the equity multiplier, how much does the stock market move for a given unanticipated change in rates. He finds that the impact is between 2.5 and 5. This means that at the extreme for every basis point cut in rates there will be a 5 basis point gain in stock prices. Of course, there will be bigger moves but the overall impact is slight relative to the daily volatility in the market. On average, the Fed just does not have that much effect on equities when there is a change in rates. The more interesting question is why monetary policy has an impact. On this point, Bernanke states that he found surprising results. The transmission mechanism of monetary policy to stocks is through the change in risk and not through changes in dividend yield and changes in the discount rate. This means that the real impact of monetary policy is its ability to affect risk on the overall economy. It is a change in macro risk which drives equity prices. Consumers will need precautionary savings and business may feel better about the risks for their investments. He ends his speech with some comments on whether monetary policy should be used to affect stock prices. The answer is a clear no. First, it may be hard to indentify when asset markets would need help. Second, the impact on stocks is small. 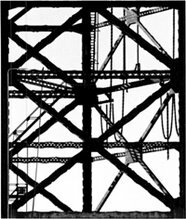 Third, the transmission mechanism is complex and indirect through the perception of risk to the macro economy. It is unwise to use monetary policy to affect equity prices directly. So what was going through their minds last week? There is a story going around that SocGen caused the major European sell-off last Monday to cover the trades from their rogue trader. If this is true, the Fed may have reacted with a 75 bps rate cut to an isolated one-time price pressure event. The Fed may have panicked and now we are left with determining what they will do this week. In an attempt to regain strength and creditability they may do nothing and hold rates steady. They took their rate cut earlier. A policy issue is what information was in the inflation and economic numbers to cause the Fed to take some action inter-meeting. There were no economic announcements on that Monday except the Richmond Fed manufacturing index. In fact, the economic news on the previous Friday was also light with leading indicators coming in less then expected but Michigan consumer confidence actually higher than expected. The big news was the Philadelphia Fed survey numbers which plummeted on Thursday. This still leaves the question of why there was an emergency phone meeting to cut on Monday. Clearly, the Fed may need to provide liquidity during tight credit situations but the cut came before the US markets opened. As a market participant, there was clear worry about what would happen to the US stock market, but part of this concern was based on uncertainty. It was not clear what was causing the selling pressure. It should be assumed that the Fed would be able to get a better read on what traders are thinking and that this information would be used to help with their decision-making. So what did they know? The Fed announcement never mentioned the equity selling pressure as a cause for the rate cut. The Fed either was uninformed or over-reacted. Of course, it could be argued that they knew the selling pressure was coming from SocGen and they were concerned about market perception. We will not know. This is not a normal way of handling monetary policy and will affect the market's perception at the current meeting. What type of Fed are we dealing with? The late Rudi Dornbusch, used to say there's one thing to understand about economics and finance -- things always happen slower than you think they will, and then when they happen they happen faster than you can imagine they would. I came across this quote last night and I think it fits well for the current environment. The credit crisis began in August. The housing markets peaked over a year before that, yet ere we are in early 2008 discussing recession. The focus and changing expectations have really focused with the equity declines since the beginning of the year, so we are now entering the second phase of this process. The market is fully aware of current conditions and economies are adapting both with new policies and with changes in behavior. We will have to see whether this is too early or late. Unfortunately, events are happening faster then we can imagine. Chris Edwards of the Cato Institute has come up with a nice description of the behavior of current policy-makers. They have all drunk the “Keynesian Kool-Aid” of a two punch strategy, loose monetary policy and classic fiscal stimulus. Is this going to work? Hardly. The monetary policy of just cutting rates has been discussed by Bernanke himself as being ineffective for solving a credit crunch. It may not hurt, but it does not get credit flowing immediately. The fiscal stimulus of temporary tax relieve has been proven to be ineffective. Economic agents understand the difference between permanent and temporary changes in policy and reaction accordingly. They will not spend temporary tax relief. Policy makers need to think out of the box for solutions. They may include in accounting and regulatory standards. George Soros provided a doomsday editorial in the Financial Times this morning. He makes a number of good focused comments, but his overall thesis is not different than many other commentators and it is filled with his own biases. It is nevertheless important to understand what a key market investor is thinking about the crisis and markets in general. Soros is not a believer in the fundamentalist view that markets will move to equilibrium. He argues that it was only through the intervention of government that markets were saved from a meltdown. This is a simplistic view of the crisis. Government was needed to provide liquidity at key points in this crisis, but it may have been the government that got us into this mess in the first place. The government provided cheap funds before the crisis began and it was the government which promoted higher home ownership through mortgage innovation. They are also responsible for this mess. Soros then argues that the Greenspan put made bubbles more likely which is contradictory with the idea that central banks prevented the breakdown. He then comments on lax regulation. It is not clear what regulation was lessened that allowed for this bubble. Clearly, more information for consumers is necessary as financial products became more complex but most of the losses have been with sophisticated investors who should have known what were the risks with structured products regardless of the ratings. His conclusions for what will happen are unsupported with any facts. What does it mean that there is less likely to be a global recession but a realignment of the global economy? The realignment is going to happen because China and other countries have had significant growth independent of the global business cycle. This growth issue is independent of the current crisis. It may be sped up but will not be stopped. The US has been “in decline” since the end of WWII because the United States helped the development of other countries around the world starting with Western Europe. Global trade is more disperse, but the United States still has been able to grow its economy and increase overall welfare. Should we worry about protectionism? Yes, but we need to consider the financial market issues first before we tackle trade. Threats of another great depression are unwarranted and just sensational writing. Is there a Bernanke put? The 1990’s were characterized by the Greenspan put or the belief that the Fed chairman would cut rates in an effort to support the equity markets. Now we have talk of the Bernanke put. It is too early to say whether the put exists as equity markets continue to descend, but we do know that there is a Bernanke shuffle toward lower rates as a way to save the banks. Make no mistake, the key beneficiaries of the cuts will be banks if we can get a upward sloping yield curve. Unfortunately, a close look at the curve shows that it is more humped with the front-end inverted or at best flat. The LIBOR curve is still inverted. The back-end of the Treasury curve is upward sloped but not overly steep by historical standards. The Bernanke cuts are less about saving the stock market and more about helping banks. The current analogy may be the S&L crisis and not the stock market bubble. Bank capital has been eroded and earnings have to be helped through lowering the cost of borrowing. It will be interesting to see whether deeds follow words. ECB president Trichet says that he is committed to inflation fighting even after the stock market decline in Europe and the 75 bps cut by the Fed. The market is betting that he will cave with a rate cut. We will see the resolve of the ECB if economic growth further slows. This tightrope walk between policy choices places more focus on Euroland economic numbers. The central bank's argument is that Europe is decoupled from the United States. There is a lag in the timing and the impact will be less. The economic research on this issue is mixed. The economic line of causality is usually from the the US to Europe for most economic disturbances and announcements. The economic impact is less than what would occur in the US, which is consistent with the ECB thoughts. However, there is the issue of slowing exports because of a higher Euro and the fact that growth is already slowing in Euroland. European growth is tied closer to world growth which makes it different from the US. The ECB may delay their action but then they could be behind the curve like the Fed. Fed still behind the curve - what about other central banks? The Fed cut interest rates 75 basis points to move the Fed funds rate down to 3.5%. The market was expected a cut at the January meeting so the cut came early in response to the market. The stock market rallied off the overnight lows but was not able close higher. We have to now look forward, but the bond market is telling us that the Fed is still behind the curve. Treasury 3-month bill rates are at 2.22 percent and the 2-year Treasury is at 2%. Fed are stuck up at a higher level by over 150 bps. There is a either a recession panic in bonds or the Fed is behind the curve. Note that if we are at a core inflation rate of 2.5% the Fed funds rate is still in positive territory. This may not be the easing that people expect. The Fed funds rate is negative only if you assume that headline inflation is the right number. This may not be enough to stop a recession. The Bank of Canada cut its rate by 25 bps which places its target rate at 4%. This will have only a modest impact and may have been more for show. What is more of a worry for the Bank of Canada and other central banks is that a low relative fed funds rate will mean that further dollar declines will be coming which will make exports more expensive at just the time when more output would be helpful. The ECB and Bank of England must be thinking that some action may be necessary to keep rates in line with the US. The Bank of England must also be looking carefully at the economic numbers because they have been coupled with the United States during this credit crisis and it will be hard for the BOE to take a different view. This could be the catalyst for more inflation. Fed cut the Fed funds rates by 75 after an emergency meeting. Will this do the trick of changing the bear market? Unlikely. At best, it will curtail the current steep decline. Lowering rates does not change the credit crisis situation, change earnings growth, or make consumers feel more confident. Defaults and foreclosures will still grow in the near-term regardless of how much easing. In the statement from the Fed, no mention was made of the equity sell-off rather the focus was on economic growth, “a weakening of the economic outlook and increasing downside risks to growth”. The Fed was also not able to get a complete consensus with Bill Poole of the St. Louis Fed voting against the move. The pictures are of Chairman Bernanke last week before Congress. Imagine how he must feel this morning. The issue is whether this decline is a liquidity event or a economic event. Monetary policy is not effective at changing the course of markets regardless of what happened with Alan Greenspan in 1987. There was the belief that this time would be different, that the world economy has decoupled from the United States, and that the Asian flu we saw a decade ago was a thing of the past. Well, think again. It is unclear what will happen in the next few hours but we are seeing the continuation of the credit crisis in another form. So much for the optimistic equity traders who have not been able to utter the words recession versus the gloomy bond guys. So much for the ultimate circuit breaker – a holiday week-end. A stock decline is justified if there is a recession but the real global move is being caused by a delivering of positions. Commodities, especially metals, are correlated with the equity move. Foreign exchange and bonds have both had good moves. A delevering of some positions has spilled over to what could be considered good positions as portfolios are rebalanced. Stronger performing markets are reduced in exposure to get them back in line with the poor performance in the United States. Again, this does not dismiss the fundamentals but explains why there is such high correlation across the board. Nevertheless, there is a sense of purpose with the sell-off. Look at the sectors that are being hit hardest, financials and cyclical in equities, high yielders in foreign exchange, and a flight to government bonds. The moves have a purpose to reduce risk and avoid those sectors which have the highest level of uncertainty. The Bush Administration announced the formation of a quick fiscal stimulus package of tax rebates for individuals and business tax incentives, but it is unclear what the impact will be even if it totals over $150 billion or 1 percent of GDP. The impact is that the reaction of consumers is unclear because it has already been suggested that the cuts will be temporary. The package may be higher than what was used in 2001. The government's expectation is that the tax cuts will be used for new consumption but recent work from the CBO states that the last tax cuts of 2001 were used saved. Indeed, some of the tax cuts boosted consumptions but a good percentage was just put away in the financial mattress. This is expected by theory if the tax cut is viewed as temporary. If you think the tax cut will be one-time and you have high debt it seems more likely that it will be used to paydown debt or placed in a savings account. If that savings is not funneled back into the economy by banks, then there will be less overall stimulus. The stock market is already thinking this. The reaction of equities on Friday was negative. The World Economic Forum in Davos has been given a lot of negative press over the last few years as a meeting place for world economic leaders to mingle and discuss world economic issues while the rest of the world suffers. This year the theme is The Power of Collaborative Innovation, but most of the reports from Davos are not focusing on the formal themes but a global level of pessimism. 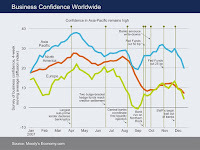 The chart shows that confidence may differ around the world but the direction is the same, down. World growth is slowing which means there will be less collaboration between countries and more old style mercantilism. Innovation will also decline and less money is spent on R&D. A new conservatism with funds is already taking place with the stronger credit controls. There will be less money for anything that is cutting edge. The new pessimism comes from nay quarters. Finance has failed economies as it has not been able to solve the age old problems of creating return without risk. Slow growth is driving new views on trade protectionism which will have the same impact as seen during the great depression more slowing of growth. Yet, the focus of Davos on innovation may be one of the most important themes of the next few years. There is a new interest in Schumpeter and the ties between the need for innovation as a driver of capitalism. We need new thinking about how to reduce the impact of credit crisis. The same old thoughts about monetary and fiscal policy may not be helpful. Pimco co-head Mohamed El-Erian and Paul McCulley, have stressed the concept of “endogenous liquidity”, the extent to which the market itself expands and contracts liquidity. His is one of the most important themes or issues facing the markets in 2008. We have seen the contract of the ABS commercial paper market which has eliminated liquidity in the sub-prime mortgage market. The credit crunch is also reducing leveraged deals that need some form of bond insurance or a specific rating. We are seeing the unwinding of carry trades in currency markets. There has also been an unwinding of some equity trading in emerging markets countries. The key to 2008 performance will be finding those markets which are most sensitive to global liquidity and tracking the ebbs and flows to endogenous liquidity. Barclay’s bank has been developing the theme of stagflation –lite, the combination of growth below trend and inflation above target. This description of the current environment has made me rethink the definition of stagflation. Instead of expecting very high inflation with recessionary growth, stagflation-lite tempers the idea and looks at more moderate combination of growth and inflation as a description. The key issue for forecasting is determining how monetary authorities will react to the trade-off between growth and inflation. We have seen most central banks focus on inflation targeting, so a new environment of low growth and inflation will cause some central banks to rethink their behavior. The decline of 20.9 was the worst monthly number since October 2001 which was affected by the 9/11 event. Prior to October, the survey turned down at the beginning of 2001 which is consistent with the last recession. The biggest decline came from the new orders and average employee workweek. The six month ahead numbers was slightly positive but were half of what was reported last month. The Business Outlook Survey is a monthly survey of manufacturers in the Third Federal Reserve District. Participants indicate the direction of change in overall business activity and in the various measures of activity at their plants: employment, working hours, new and unfilled orders, shipments inventories, delivery times, prices paid, and prices received. Are commodity price shocks inflation? Bernanke noted in congressional testimony that commodity price increases "by itself are not sufficient to evaluate the inflation situation". Commodity prices do not provide"pure information about inflation". All of what Bernanke says is very true. However, the increases in commodity are not really supply shocks but caused by excess demand from the increase in wealth in many emerging market countries. The increase in consumer demand is a result of relatively loose monetary policy over the last few years. Commodity price shocks are not thought of as inflationary, but the impact of price shocks with commodities are often the same as an inflation increase if the commodity effect large portions of the economy or consumer. There is an erosion of purchasing power and a decrease in nominal wealth. The true issue of inflation is interjected when we look at the potential reaction of the central bank. If the central bank wants to offset the erosion of wealth from the price shock in commodities, then it will decrease interest rates which will increase the amount of money in the system, This increase in money supply will potentially lead to a general increase in prices which is inflationary. Does the Fed monetize these price shocks? The Fed will say that they do not. They will state that they are providing liquidity to offset the downturn caused by the credit and housing markets, yet the same problem exists in the case of a commodity price shock. Does the Fed use monetary policy which affects the entire economy, to solve a localized or specific shock whether housing, credit, or commodities. It is the blunt instrument of monetary policy which has the potential for inflation. Housing starts continue to fall with the decline in building permits following the same trend. This decline is needed to reduce the decline in pries and housing rates. The US economy is clearly in recession territory for the housing market and have fallen from a much higher level. We have moved right through the 2000 recession levels so we have to use 1990 as the comparative anchor. The pattern for housing is very much the same for most recessions, a steep decline and a slow rise so it is unlikely that home building will reverse any time soon. In fact, it took years to get back to the pre 1990 recession levels. The capacity utilization has stayed flat at 81.4%. Plant and equipment is still being used. The recession would see the utilization rate fall swiftly below 80 percent. A high utilization rate also gives us some insight on potential inflation. With the utilization rate below the highs, the inflation focus will be on commodities and not production. Industrial production showed a zero increase slightly higher than expected based on stronger exports. Last week the trade deficit increased but that was caused by higher energy import costs. Factory production is weak and has slowed over the last 18 months. CPI stays within expectations but still above target. CPI is up 4.1% YOY which is slightly less than last month but way above the average for the last fifteen years. CPI ex food and energy was within expectations at 2.4%. The level is similar to what we say in the beginning of 2006 when we saw a sustained bond market sell-off. We also saw a tightening Fed who was interested in inflation. Times have changed and the Fed is willing to take higher CPI in order to boost growth. Equity markets will not be happy with the advanced retail sales numbers but we have seen worse one month numbers. In fact, the negative retail sales in June of last year was double the current number. A close inspection of the retail numbers show that there are seldom back-to-back negative numbers. The trend is more important given these reversal fluctuations. The three month moving average is still positive but the trend is heading lower. PPI has stayed around 2% but is still almost 100% over what was seen in July of last year. PPI ex food and energy has come off of its high yet is still at some of the highest levels since 1990. Given the food price increases so far in January, it should continue to stay at the current levels. The largest state bank for Saudi Arabia, National Commercial Bank, is calling for the government to alter the riyal's peg with the dollar. So far the Saudis have held the line on any change in the currency. They have also maintained that the price of oil should still be quoted in dollars, but there is mounting pressure for a change to stop the internal inflation associated with the dollar peg. The valuation has been in place for 21 years. Inflation is now at 5.35% over the last year. The banks' chief economist is also advocating a sovereign fund to reduce the exposure to US Treasury bonds. The US and UK economies are looking more alike and that is causing the GBP gains over the last year to be reversed. What made the Pound increase in value was good growth with low inflation. The numbers were appealing relative to the U, but since hitting a high in early November the pound has decreased by over 7%. Much of this decline is associated with the fallout from the credit crisis. We are seeing the same type of mortgage mess and credit problems with banks. Credit has become restricted. Inflation is higher, and the Bank of England has been forced to ease interest rates. The story sounds familiar. A high correlation would usually mean a range market for the currency, but in he case we are expecting that the pound will decline versus other major currencies and may underperform relative to the dollar. Demand is high and the supply is not available. Soybean harvests are expected to be 6.5 % lower than last year,corn inventory will be 20 lower than the previous year, and wheat planting are expected to be less in the United States. there is no easy solution for meeting the high demand for grains. Price does not seem to be changing the demand enough to allow inventories to grow. A main cause for this run up is the demand for ethanol. With increased demand for corn, there is more marginal crop switching which reduces the production of soybeans. Now there s a limit to the amount of switching but if ethanol takes out fixed and growing percentage of the acreage, there will be less opportunity to switch in response to price changes. We are not picking on ethanol, but it is an obvious choice. With plant and equipment built for production along with government subsidies, the demand for ethanol starts to become inelastic. The cost of producing ethanol is now a burden on traditional grain consumers who may have more elastic demand. Corn prices are up 90 percent from a year ago. Bloomberg corn and soybean surveys still show a strong bullish bias. There is little information to suggest that prices will decline over thee next month. One of the sure signs of inflation uncertainty is gold hitting $900 per oz. Gold has not been a great inflation indicator over the last decade if you just look at its correlation with inflation, but the combination of a declining dollar and higher inflation in other parts of the world suggest that gold is now becoming a store of value alternative. Inflation may be rising in the United States but it is only slightly less in other countries. There is a breakdown in current inflation targeting as many central banks have focused on growth. Euroland and Great Britain are facing slower growth prospects as well as above trend inflation so these currencies are not a safe haven. Japan is also facing slower growth and has been subject to wild swings in value. Emerging market currencies just do not have enough liquidity to be able to serve as a store of value, so the only alternative is gold. The market has bow moved up $100 in four weeks and $200 in the last year. After the ECB makes strong comments on the worries of inflation and the potential for tightening action in spite of the European credit problems, Fed chairman Bernanke sends the signal that more rate cuts are needed. The US economy is slowing and the Fed is worried about growth not inflation. He stated that “we stand ready to take substantive additional action… to counter any adverse dynamics that might threaten economic or financial stability”. As commented before from one friend, “The helicopters are warming up on the tarmac… get ready for the money.” The stock market reaction was quick, it loves money. The bond vigilantes are back and hit the debt market hard. The dollar sold off. What happened to the much talked about Fed projections and forecasting power? It seems like the new transparency and forecasting policies have been thrown out the window which hurts Fed credibility. We should not be surprised that the Fed would move to lower rates given all of the headline risk about the poor economy. The forum for this announcement is the problem, not that there is anything wrong with the Women in Housing and Finance and Exchequer Club Joint Luncheon. Unfortunately, running monetary policy through speeches and making pronouncement without the FOMC diminishes the stated objective of trying to provide more transparency. This type of policy forces the markets to look more closely at every speech and increases the chances of for inter-meeting moves. All of this adds to market uncertainty which is not what anyone should want. What happens if the rates cuts do not keep coming after the Chairman states that they are needed? One of the key macroeconomic events of the last 20 years has been the great moderation in volatility of output in the US. Changes in output volatility have trended down for years and the business cycle has been dampened. This moderation will be tested in 2008 if we move into recession territory, so understanding the reasons for the great moderation are critical. Most researchers have suggested that a combination of good monetary policy choices with luck have been the key reasons. The US economy also has not had the supply shocks of previous decades. An interesting piece of research suggest that the reason is also tied to globalization. The increase in foreign direction investment by US multinational firms have helped to dampen the fluctuations. Albeit explaining about 20% of the dampening, it provides an interesting perspective. See http://www.bepress.com/gej/vol7/iss4/3/?sending=9972, "Aggregate Gains of International Diversification through Foreign Direct Investment: An Inquiry into the Moderation of U.S. Business Cycles" by Luis San Vicente Portes. Multinational corporations have diversified funding costs, investments and production as well as sales. The diversification has reduced the investment fluctuations in the US. Not an easy argument for some to accept during the current times, but an interesting twist on globalization. The ECB kept interest rates at 4% and stated that they have a tightening bias. With inflation moving higher and growth declining, the ECB is between a rock and a hard place with their choices. Stop inflation by at least holding the line on rates or cut rates to stimulate growth. They have continued with their inflation bias in spite of the continued turmoil in the credit markets and the increasing likelihood of a US recession. So much for coordination of monetary policies in the G10. A tight ECB policy will be dollar negative from a capital flow perspective. The rate differential will be favorable for Europe; however, anything that forces growth lower in Europe will be negative for equities. This policy choice places a greater burden on emerging markets to drive global growth. While the inflation adjusted numbers make the current prices not the highest we have seen, the point is irrelevant. The relevant issue is that all US recessions have been preceded by an oil price shock. The run-up in price over the last twelve months constitutes a price shock. A price shock is foremost a significant unanticipated change in price. We have had that with gains of over 50% since the beginning of the year. The shock will be worse if the level stays above $90 per barrel. The price has only broken the $90 per barrel level for two months. Whether it is a demand shock from higher growth, a supply shock from a lack of production, or a risk premium shock which inflates futures prices, the result is the same. Higher prices will affect relative consumption. Wealth will move from oil users to oil producers and will affect the relative growth around the world. Consumption in oil producing countries will offset some of the decline in consumption in western countries, but it is highly likely that growth will slow in the US. This will affect US capital markets. The impact will be cushioned because oil producing countries do not have as developed capital markets, so some of the profits will be plowed back into the West. Petrodollars are alive and well and will flow to what are considered the best opportunities which may include US fixed income if we have a recession. You would usually think that high grain prices would start to curtail demand but that is not the case for an inelastic commodity. In fact, there has been a scramble for grain with many countries trying to lock0in supply before there are shortages. Food inflation will lead to political unrest so many developing countries are not waiting for prices to turn down. Consequently, export announcements and rain deal are becoming an important driver for the market. Wheat was up again today as a Pakistan announced a new purchase and India lifted import duties on flour. Planting expectations are expected to be about 4% higher but that will not be enough to offset the current hording mentality. The yuan appreciated 7 percent in 2007 versus an increase of 3.3 percent in 2006. The pace of appreciation has increased in the last few months and there is a growing belief that the yuan will see even greater gains in 2008. Foreign exchange reserves now total $1.46 trillion driven by the trade surplus which increased 52 percent through November. We may like to believe that Treasury secretary Paulson was a persuasive communicator when he was in China last year, but the truth is probably closer to some simple economics. The Chinese economy is facing strong inflationary pressure. Food prices have increased double digits (18.2% yoy) and the latest numbers for November show an increase of 6.9 percent yoy. One way o reduce the inflationary pressure is to have the currency increase and buy more food imports. The increase will also slow growth for some of their export businesses. The appreciation will also stem some off the pressure for trade restrictions. Chinese manufacturing took a beating in bad PR in 2007. Some have been arguing that this is a one way bet, but fighting managed floats when a country has great reserves can be dangerous if the government decides to punish speculators. My biggest surprise for 2007 was the equity market downturn that did not happen. The credit crisis in August caused significant upheaval in the sub-prime and CLO markets. Spreads for money markets were greatly affected and still are wide by historical standards. A liquidity crisis required not only intervention with a discount rate cut, Fed funds cuts through the rest of the year, but year-end fund injections. The Fed provided liquidity which may have mitigated some of the loses, but credit has become less available because of tightening standards. Central banks around the world have been forced to increase liquidity in an environment that is closer to seeing increased inflation The housing market is in shambles, rating agency reputations are gone, and financial firms have needed bail-outs from foreign firms. Chief executives had their careers short-circuited, yet the S&P 500 index still showed a positive gain of 3.5% for the year. The highs for the year actually came after the credit crisis began. So why did we not get our downturn? The timing may be off. The economy is still adjusting to the real effect of the housing sell-off and the tighter credit conditions in the US economy. The sell-off and slowdown may still come, but it will just take more time. Unfortunately, this is the lament of many forecasters. I am right on the direction, but my timing is off! More specifically, this timing issue is tied to the elusive consumer wealth effect. Do consumers feel poorer because of the declines in housing prices? The timing between financial wealth changes and consumer behavior is one of the most difficult relationships to effectively measure and certainly not something that changes quickly, yet I would have expected a bigger decline in confidence and spending given the size of the credit problem. While the timing issue could off, housing peaked before 2007, so the wealth changes have had some time is sink in for many consumers. The housing crisis is a regional phenomenon. The housing bubble has been pricked but most of the current correction is focused in a just a few areas which have been overbuilt and saw significant price increases, Southern California, Nevada-Arizona, and Florida. Other areas have actually seen modest appreciation. Most housing prices are still higher than levels of five years ago; consequently, most consumers may be unaffected by the CBO mess. An economic slowdown will occur, but great loses will only be seen by limited groups. This argument focuses on sector dynamics. The stock market will see sector decline but not a large sell-off. Central banks got it right. Liquidity was provided and a problem was averted. Of course, we will not know if this is a right answer until next year. We also may be affected by the unintended consequence of higher inflation if the liquidity increases were overdone. The credit problem has mainly been in the SIV commercial paper sector which has shrunk. The power of globalization. The complexity of globalization can be found in the buoyancy of markets to the credit crisis. The sub-prime mess has had a global character with banks hit with loses in Europe and other parts of the world, so to some degree the mess was spread across a wider audience. The banking problems were so large that foreign central banks have had to pour liquidity into the markets to stabilize the rates. The lowering of US rates was a key catalyst for the significant declines in the dollar during the second half of the year, yet globalization has been able to provide support for the US economy and markets. First, the decline in the dollar has led to strong increases in exports which have offset some of the declines in home building on GDP. While the decline in housing has been substantial, the manufacturing sector is still large, so any gains will have a magnified impact on the economy. Second, the strong growth outside of the United States has been a boom for US companies with overseas operations. Profits have been growing outside the US and the translation back into dollar has further increased the earning s of large cap companies. This has offset some of the declines in financials sector of the market. The declining dollar has made some assets in the US look cheap. Foreign firms have stated to make US purchase although some of the capital flow numbers seem to suggest that buyers have been hesitant about purchasing debt instruments. One of the book that had an impact on me in 2007 was financial history piece, The Panic of 1907: Lessons Learned from the Market’s Perfect Storm by Robert Bruner and Sean Carr. The authors make a strong case for panics started by small changes in expectations and the actions by key players in the market. Individual make history and the actions of the few could carry over to an entire market. Yet, in 2007 there was no widespread panic. We are still sifting through the problem, but the match that was supposed to ignite the market never materialized in the way expected.